Our professional commercial kitchen and outdoor BBQ are fully equipped to prepare impressive meals with ease for your friends and family. Complete with 5 burner gas stove and oven, Dishwasher, 2 fridges, Microwave, Toaster, High speed blender, Quality crockery and cutlery, kitchen accessories and utensils, picnic hamper & BBQ set, plus a 3 meter antique wood dining table for inside or outside dining, and speaking of the outside... 5m by 5m patch of lawn with ‘BigBoy’ bean bags, a cabana with big TV for outside movies and a giant 2m by 2m daybed for star watching or tanning. All beds are luxurious KingKoil, all bedding 1000 thread count hotel quality linen, and additional bedding, towels and beach – towels are provided. The media room and living room both have 65′ and 75′ TV’s with Foxtel, plus DVD in the media room. All the modern amenities and comforts for the digital age - fast internet, a comfortable media room. So close to the beach with great surfing, stand up paddle boarding, kayaking, swimming and relaxation on the sand sofa one of the best beaches in the world. 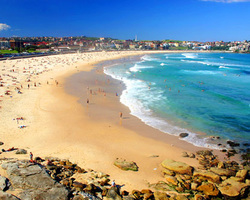 There are 2 bikes for exploring Bondi and 2 surfboards available for use as well as a washing machine and dryer. Sorry but parties are prohibited, and no groups of under 30 year olds. Harrison, March 2017 - Incredible. Super friendly and helpful hosts that went out of their way to make us welcome. Excellent value and location for a medium to large group. Would definitely visit again without hesitation. Lauren, Feb 2017 - Jet was a fabulous place to stay for our family group....location, ammenities, comfortable beds, plenty of bathrooms, great kitchen and the decor was lovely. Check in and communication was great, would definitely recommend staying at Jet.